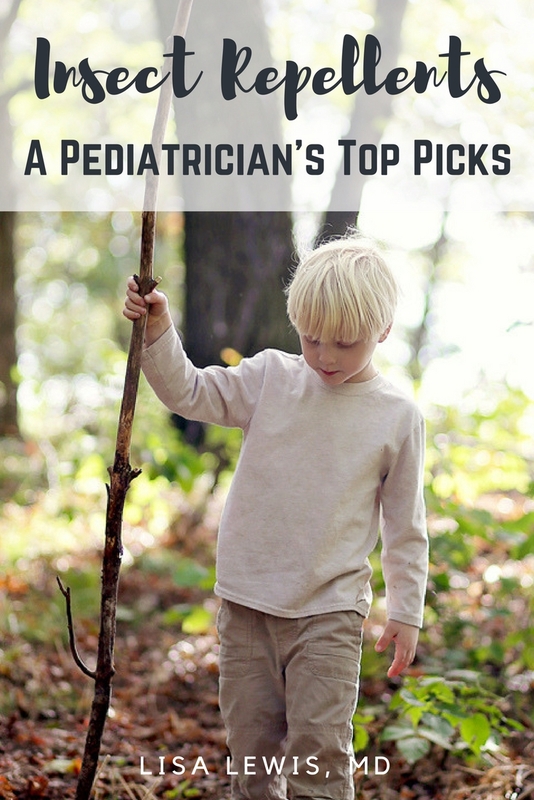 Insect Repellents – A Pediatrician’s Top Picks! Biting bugs outside can be a nuisance, but so can excessive use of insect repellents. The following list is helpful for choosing a child insect repellent with a lower toxicity profile based on my own research and clinical experience. Coleman DEET-Free. This stuff works well. It has a component called IR3535, which has been safely used in Europe for over 30 years to repel insects without any major adverse effects. REPEL Lemon Eucalyptus or OFF! Botanicals Plant-based Insect Repellent. These repellents are derived from oil of lemon eucalyptus. For you essential oil lovers (I love lavender, personally, but that’s another post), do not use essential oil that is not formulated for use as a repellent on your skin. You can diffuse oil of lemon eucalyptus outside, but if it’s not formulated as a repellent, then it may not work properly or may cause toxicity if ingested. AVON Skin So Soft lotion. You can apply a light coat of AVON Skin So Soft lotion to babies’ skin six months and older. Skin So Soft has a light fragrance that repels insects and has not been found to be toxic like agents such as N,N-Diethyl-meta-toluamide (DEET). This product can be bought on the web or through an AVON distributor. I don’t recommend the insect repellent made by AVON since it has sunscreen combined with more harsh chemicals. DEET (N,N-Diethyl-meta-toluamide), such as OFF! Family Care. DEET is toxic in high doses. Dose toxicity in children not defined and unclear. Classified as category III in toxicity profile. 2-undecanone, such as BioUD. This is a substance that comes from plant products, but it’s too new to clearly understand the safety profile for children. Picardin, such as Honest Bug Spray or Skin So Soft Bug Guard Plus. Classified as category III in toxicity profile. There are less toxic products on the market as described above. Always wash off insect repellents when you come in from outside. No chemical substance should be hanging out on your couch. Insect repellents on babies should avoid the face, hands, and bare feet. This practice will help avoid accidental ingestion or eye irritation. Don’t mind a mess? Treat your child’s clothing with insect repellent before going outdoors. I make no promises about washing out an insect repellent, so do this on play clothing that you don’t mind possibly staining. There are products made specifically for clothing, but I don’t recommend them currently since the ingredients are harsher. Consider covering your child’s body with cotton long sleeve shirts, pants, socks, and shoes. In the summer, your child will still be OK in breathable cotton. Other materials may not be as comfortable. Bed nets are a good option if needed. If there’s too much traffic in and out of your house door or not enough screening or air-conditioning, bed nets make a good option to protect your children from insect bites. Citronella candles or other devices to put in your outdoor space. These are not research proven, but I’ve seen them work. Be sure any candles are high up so they can’t cause a burn or fire. Plant sweetgrass. Native Americans have long used sweet grass as an insect repellent. 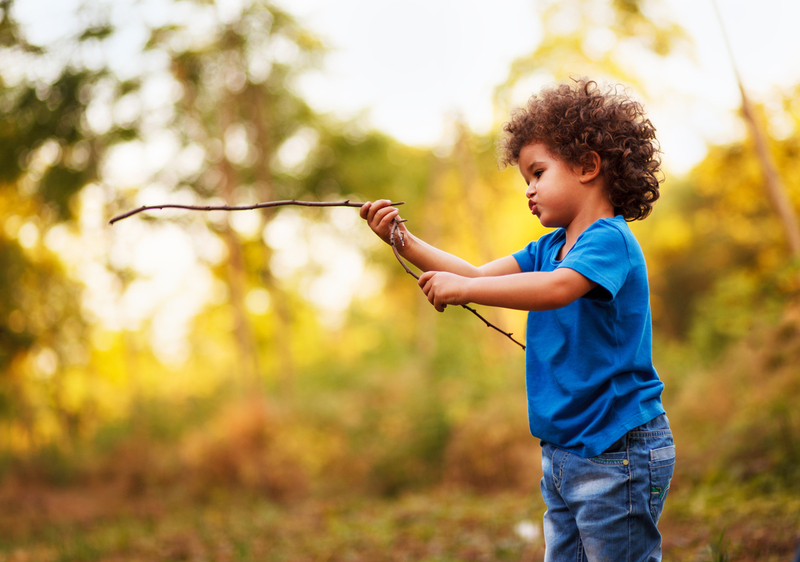 Researcher Dr. Charles Cantrell from the American Chemical Society states, “Sweetgrass gives off a sweet aroma that deters mosquitoes.” It's OK to enjoy planting sweetgrass with your children, but ensure they don't ingest the plant. As with many herbs, the chemicals in sweetgrass can be toxic in large doses. Use a high output fan in the area where you are hanging out. Mosquitos are lightweight and will be easily blown away.